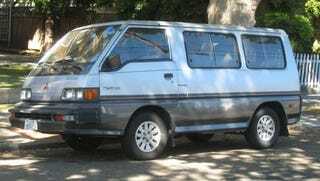 You still see a few of the mid-engined 80s Toyota vans around, but when was the last time you saw a Mitsubishi van of that era? Very few of these things were sold in North America back in the day; in fact, I can't even figure out what Mitsubishi called this vehicle here; was it marketed as the plain ol' Mitsubishi Van? Van Wagon? In any case, the 1988 Mitsubishi van is one seriously rare machine, and so it has earned its place in DOTS Truck Monday. Looks like this van wasn't actually sold in North America, according to the Guamanian dealership emblem. Back when the Alameda Naval Air Station was in full effect, you used to see plenty of license plates from Hawaii and a few from Guam in town, as the Navy would transport sailors' vehicles when they got transferred from base to base. Most likely this Mitsu was originally brought to Alameda in that fashion. It sure looks a lot like the Toyota Van Wagon, doesn't it?